Free Iced Coffee @ Dunkin Donuts Today!! 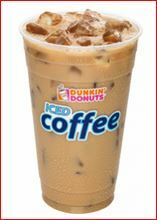 Today is FREE Iced Coffee day @ Dunkin Donuts! Just for walking into your local Dunkin Donuts you can score a FREE 16oz iced coffee! Call your local store to confirm participation. No coupon required. So far, select stores in in Virginia, North Carolina, South Carolina and Augusta are confirmed to be participating. Please comment below if your local store is confirmed to be participating and not on the list. starting out, he attempted covering his shoes in fish scales. Louboutin left for New York and met with his loyal 200 customers. has been enriched with compost and other organic matter.